I've been a lurker for a while and I'm saving for my first Orange it'll be my first amp since my old Valvestate 100 went bye bye years ago (I moved over to acoustic the last few years). I have seen the TH30 and the Rocker32 at roughly the same price (the TH30 being slightly cheaper). I'm aware that Rocker32 is geared towards stereo but it's very flexible. I can't really find any direct tone comparisons on the 'tube or elsewhere so I was curious does anyone own both and how do they compare tonewise? I'm guessing the TH30 is more "modern" sounding - I'm not a metal head but I like to play heavy sometimes so could the Rocker32 hit gain like the TH30 with a boost/drive pedal? I think both sound great but I'm leaning towards the 32 for flexibility and it sounds awesome with pedals form what I've heard online. Yet the TH30 can sound tight and heavy for when I want it. Realistically since at first I'll be at home playing the Rocker15 would make more sense but I honestly want something that I will be really happy with playing live when that happens. I can only afford one amp - I've 4 kids to support and work alot and most of my money goes towards that. I've a few pieces of equipment I'm thinking of selling to speed up the amp purchase. I realise tone is subjective but I think we could compare objectively. So if anyone has some input that would be fantastic. They're both going to sound like Orange amps. You have to figure out what features mean the most to you and go from there. I don't know where you are but there's no substitute for going to a dealer and trying a few out. The Th30 is the only orange amp I've tried in a dealers which I did n't particularly like but that would not of been at any decent volume. Do u own a guitar cab already? If so I'd consider the Rocker 15 terror very versatile and with a 2x12 cab loud enough for gigs but perhaps an expensive option if you have to buy the head and a cab. 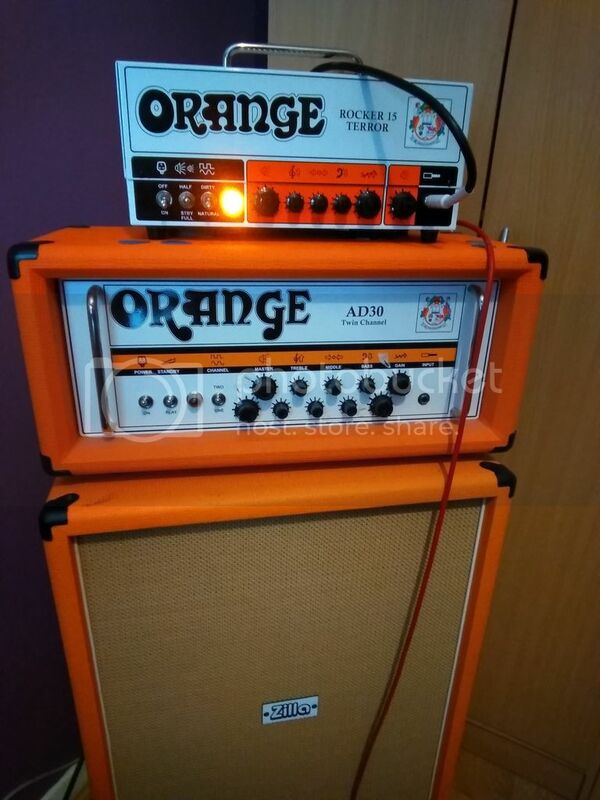 If you don't need an effects loop what about a second hand Ad30htc and Orange cab? The TH30 has a beautiful, and very loud, clean channel with eq. The R32 has a fixed clean/natural channel EQ which may need an eq pedal to get the tone you want. The TH30 does indeed have more gain due to an extra gain stage and if by "more modern" you mean "sounds compressed" then yes it does compared to the Rocker series.. which is not a high gain amp. The gain character of the two amps are also therefore opposites ie R32 open & dynamic; TH30 compressed and smoother. The tonal character is also different.. the shape knob on the TH30 turns from classic rock to metal ; the R32 with a regular 3 band EQ will not do a smiley face metal style response (nor sound good at it either). In both cases, response to pedals is excellent.. you can of course add pedals in front of R32 for more gain or a fuzz , and EQ the tonal response wherever and however you like on both amps. My only dislike with the R32 is that you're locked in the 2 10" speakers format. The R15 terror and OBC212 would be my choice (new). As Ronnie suggested, the AD30tc is a blues/rock/indy/hard rock beast.... but expensive unless you go 2nd and factor in new EL84 valves. Do go and try some though. 15w is incredibly loud already, more than enough to play with a drummer. The Rocker 15 have a Bedroom switch. Very usefull when you have sleeping kids. The Rocker 15 will have enough gain if you had a overdrive or fuzz in front of it. The Rocker 15 is loud enough for most gigs if you had a cab. I prefer using the internal 10 inches with a ppc112 (so a 10" and 12" combo). You can also buy the Terror and pair it with the obc212 cab. I've said most gigs... Sometimes, 15 watts is not enough, but those times are getting rarer every year. Fair enough, I can't argue with that. Sorry for the delay replying - many busy weeks of work. Thanks for the reply. Sadly I don't own a cab so I'm looking at combos only. It'll be later this year when I buy something. In the mean time there is an Orange dealer in Ireland and I intend on taking a saturday to go and try out a few models. Cheers again for the advice. LOL. No worries. I'm sure an eq can extend the TH30. I'll just have to try whatever amps I can my hand upon in a store and see how it goes. Thanks a lot for the help, all replies are appreciated! The TH30 doesn't have to be "metal" or "modern". If you keep the shape knob and the gain below 12:00 It's pretty much classic rock. It sounds like it's versatile so. Hmm food for thought. Turns out the only orange amp I can test out is a R32. I'll definitely try to get to play that but it's a pre-owned so it might be sold on before I get a chance to see it. Mostly I do Creedence, Allman Bros, ZZ-Top, stuff like that. My TH30 likes it, me too. Of course it can do metal, but it's not a must, just keep the gain down, or crank the Clean channel for more classic gain tones. I also have to say that I don't play with particularly hot pickups, alnico 2 paf style HB's, and alnico 3 in my Tele, those are the ones that sound best trough my TH30. Nice. How well does the clean channel take pedals do you think? Italicised clean as I see the R32 has a natural channel and I presume it's less coloured or something. I can't compare it to the R32, but a friend of mine has the R15, if the natural on them is similar, the TH30 would win this battle. He uses the dirty channel for cleans, so he can use the EQ, and I must say it works pretty well that way. On the TH30 it's almost Fender clean with the right settings, once I plugged it into 2 Jensen's and was amazed how fendery it sounded. All pedals sound great trough the clean on mine even the Janus Fuzz/Trem from Walrus, it's a very smooth trem effect not the chopping thing and sound's absolutely incredible on that channel. My ex literally melted away when I did Nancy Sinatras Bang Bang on it! i never knew the th30 could do metal. or never considered it. looks like i'll have to start looking at it more.